Browse: Home / Flytrap is a simple network scan detection and mitigation tool. Flytrap is a simple network scan detection and mitigation tool developed at the University of Oslo as a replacement for LaBrea. Flytrap listens on a network interface for unanswered ARP requests and assumes the identities of the requested hosts. It then logs all traffic to that address, and optionally responds to TCP connection attempts in order to slow down the scanner. 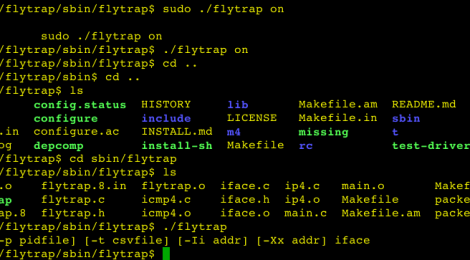 flytrap – Detect and trap IP scanners. ← hcxtools – tools to capture and convert packets from wlan devices for the use with hashcat.